Wobbles can be executed in several departments of the harp. They are achieved by direct bending in one hole (this could be a draw bend or a blow bend), rolling into an adjacent hole and then returning to the original bent note or, as in this case, a second bent note in the original hole. Join us on our journey into rocking blues and all will be revealed. Rod recorded the instrumental on his 1993 solo album Harpburn, but both melodies incorporated in it are from the 1950’s. The first was composed and originally recorded with the The Satellites by Bobby Day. It was popularised by Thurston Harris in 1957 and has since been covered by countless artists including TheDoobie Brothers, Delbert McClinton and Huey Lewis & The News. Thurston Harris’s single on Beverley Hill’s Aladdin label shows the composer as R.Byrd, which was Bobby Day’s real name; Robert James Byrd, Snr. Musically it is worth noting that the tune does not change key. Day and Harris both recorded it in Ab major complete with the all-important finger clicks. 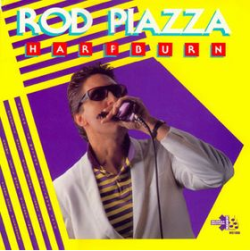 Rod Piazza switches it up to A major, playing cross harp on a D major diatonic. 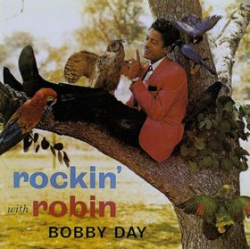 A year later in 1958, Bobby Day hit No.2 on the Billboard chart with his solo recording of Rockin’ Robin, a tune written by Leon René. It was also recorded in Ab major but has the three chord changes common to blues and rock’n’roll, as well as a middle eight. Again this tune has been widely covered. The best known version was of course recorded by Michael Jackson for Motown in 1972 on his solo album Got To Be There. He sang it in the key of F major. And here’s some trivia for you; he also recorded Little Bitty Pretty One the same year as part of the Jackson 5 on the group’s Motown album Lookin’ Through Windows. Now down to business. First you need to crack the intro melody, Little Itty Pretty One. Check out Rod Piazza in action in the video below, then come back and start work. You’ll need your favourite D major diatonic and your chops. This is where you need to master that killer wobble we mentioned earlier! For the key to our tab by the way, check out our Harp Theory section. Note: If you can overblow and want to remain faithful to the original melody, try showing off with the tab in blue. And so to the second melody, Rockin’ Robin. Take another look at the video below then come back for some more harp action. We’re still in A major, playing cross harp on a D major diatonic. And there’s that wobble again. And the finale which is a sustained octave while the band descends in semitones beneath..you just need to familiarise yourself with the timing. We have marked the downbeat in bold. Well done, now you’re all set to get the band involved and blow away the audience at your next gig! Don’t have a band? No matter – get your shades on, hit the video again, click your fingers and play along with Rod Piazza & The Mighty Flyers. 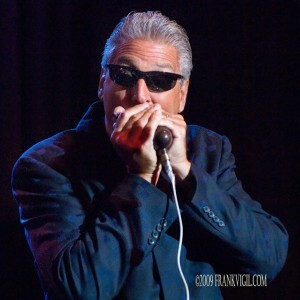 ← Pencil Full Of Lead – Which Harmonica? Send your Tabs. Excellent ! Hi Bob – did you mean in addition to the ones on line?